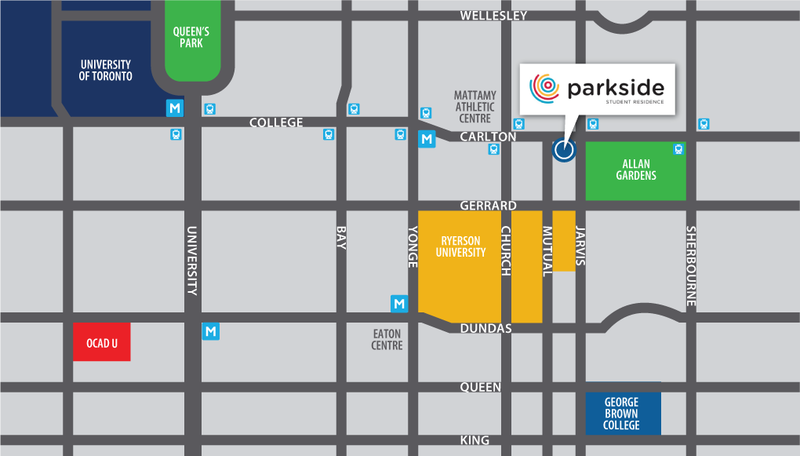 The Parkside Student Residence is owned by an affiliate of Knightstone Capital Management, a Toronto-based real estate investment, asset management and development company which re-developed the property in 2015. Property management services are provided by Canadian Campus Communities (CCC). CCC has established itself as Canada's premier provider of student housing services to colleges and universities, offering private sector assistance in managing on and off-campus student housing. CCC's extensive student housing experience enables them to develop innovative student communities that meet the needs of university partners and clients, while providing the most cost-effective, luxurious student living and learning communities for student residents. CCC’s corporate office is located in Austin, Texas with its parent company, American Campus Communities. Monday thru Sunday 9 a.m. - 9 p.m.
Sunday to Friday 9 a.m. - 1 a.m.